Copyright � 1993 by the American Geophysical Union. The Central Kerguelen Plateau (South Indian Ocean) is characterized by abundant north-south striking normal faults, which comprise two prominent north-south rifts known as the 77癊 and 75癊 grabens. The 77癊 Graben is a well-defined structure which extends over some 800 km from the eastern margin of the Kerguelen Plateau to about 58.5癝. Over most of its length it is associated with a 10� km wide axial rift and with a 100�0 km wide uplift. The 75 癊 Graben is less well documented, but the available data suggest that its dimensions and internal structure resemble that of the 77癊 Graben. In the better documented 77癊 Graben, six rift segments, 50�0 km long, are identified. Faulting is more developed at the northern and southern ends of the 77癊 Graben, possibly resulting from the interaction with other rifts. To the north, the 77癊 Graben abuts the highly faulted eastern margin of the Kerguelen Plateau and the northern part of an even larger rift zone, the Plate Boundary Rift Zone, which extends along the boundary with the Australian-Antarctic Basin. To the south, the 77癊 Graben adjoins the northwestern end of the Southern Kerguelen Plateau Rift Zone. The 77癊 and 75癊 grabens, and the other rift zones on the Kerguelen Plateau, appear to have been formed at approximately the same time, between 72 and 60 Ma. They are all part of an important extensional phase which occurred in the region and mark the beginning of the process which led to the development of the Plate Boundary Rift Zone into the Southeast Indian Ridge, between 46 and 43 Ma. The north-south trend of the 77癊 and 75癊 grabens is different from that of the other rift zones, which are oriented northwest-southeast. This geometry suggests that some strike-slip motion may have occurred along the north-south trending grabens as a result of extension on the northwest-southeast trending rifts, particularly the Southern Kerguelen Plateau Rift Zone. However, since near-surface extension estimates for the Southern Kerguelen Plateau Rift Zone are small, the strike-slip motion along the 77癊 Graben must be equivalently small. Also, the available seismic data from this graben do not show typical seismic characteristics of a strike-slip environment, such as zones of compression or flower structures. 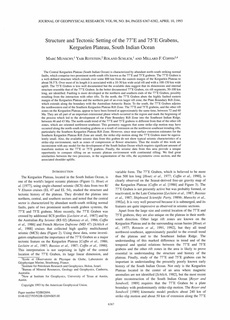 Thus the results of this work are inconsistent with any model for the development of the South Indian Ocean which requires significant amount of transform motion on the 77癊 or 75癊 grabens. Finally, the seismic data from this area provide a unique opportunity to compare rifting on an oceanic plateau environment with continental rifting. We find great similarities between the two processes, in the segmentation of the rifts, the asymmetric cross section, and the associated shoulder uplifts.